Epsilon Sigma Alpha, International – is the full name of our organization. We are international because we are located in Australia and Canada at this time. Historically there was a point in time when we were located in many other countries. The word “sorority” has confused the definition of what kind of organization ESA is and we are working to eleminate its use. Often we are confused with the college sorority, which is definitely an error, although we do now have ESA chapters on college campuses. However – we are NOT Pan-Hellenic or affiliated with any college fraternity. Today the organization is distancing itself from being called a sorority because of that confusion. We are an organization of "mainly women" who have a three-fold purpose: education, philanthropy, and social goals. We say "mainly women" because we are now accepting men into our organization. We have chapters that are composed of couples now being formed and men can join ESA as regular members – although these are currently more the exception in ESA than the usual practice. We welcome men to join ESA and this population is growing especially on college campuses. Lesson 1 covered the opening and closing rituals, which are actually a part of the honored traditions of our organization. ESA has several symbols that signify its traditions and values. The flower of ESA is the Yellow jonquil: This flower was selected because of the love the ancient Greeks had for it. It was associated constantly as “Persephone’s flower.” Persephone’s was the daughter of the Greek Gods - Zeus and Demeter. The Association's colors are Blue and Gold. The crest of ESA: This is a flat-topped shield enhanced above by a lamp and below by a streamer featuring the letters ESA. The shield is divided through the middle by a wide chevron (inverted v) containing six candles. The apex of the chevron is joined to the top of the shield by a bar dividing the upper half into two sections. In the upper right corner is a jonquil. The upper left corner features an open book, and in the lower part of the shield below the chevron appear the clasped hands of friendship. What does the color BLUE signify? What does the color GOLD signify? What does the first on the crest candle signify? What does the second candle on the crest signify? What does the third candle on the crest signify? What does the fourth candle on the crest signify? What does the fifth candle on the crest signify? What does the sixth candle on the crest signify? The ESA Pin: As a pledge you were or will be installed into ESA by a pledge ceremony where you receive the first half of your membership pin. - The Grecian lamp of Knowledge. The Lamp is a symbol of the goddess of Athene. 9. Where is the pin worn? 10. Who can wear the pin? 11. When is the pin worn? The Jewel Pin has 10 jewels surrounding the open book. Each pearl has a special significance to the wearer of the pin. These comprise the TEN WATCHWORDS OF PALLAS ATHENE. These are the ten attributes, which every ESA member strives to achieve in her life. What does each pearl stand for? 12. What does the first pearl signify? 13. What does the second pearl signify? 14. What does the third pearl signify? 15. What does the fourth pearl signify? 16. What does the fifth pearl signify? 17. What does the sixth pearl signify? 18. What does the seventh pearl signify? 19. What does the eighth pearl signify? 20. What does the ninth pearl signify? 21. What does the tenth pearl signify? 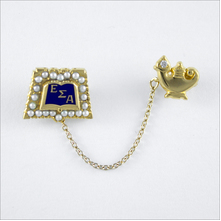 The jewel pin comes to the member as a part of the initial dues. There is also a different pin that can be purchased which is called the “full-crown” pin. It has to be purchased and does not automatically come with your initial dues. It can be worn in place of the regular jewel pin. It costs more, is larger, and comes in 14 carrot gold. This pin can be found in the ESA Merchandise catalog. If you have Questions on Lesson Number Two do not hesitate to contact the pledge master.